Take 11 (the only 2-d palprime). So 131 and 151 are palprimes. So 11311, 13831, 17971 are palprimes. 5. 421 are 9-digit palprimes (from a total of 5172) which when inserted in 11 give 1pp1 palprimes. See also A103992, A103993. 6. Now Q is shifted to 11-d palprimes. 1 4 2 ? ? ? 3 15 3 ? ? ? 5 93 9 ? ? ? 7 668 93 ? ? ? 9 5172 421 ? ? ? 11 42042 ? ? ? ? Everyone with some spare time is invited to complete the above tabel. Will the following ever happen again ? Is the number 10501 a unique palindromic prime ? When added together with its preceding prime and its following prime, the result is again a palindromic prime. Consult also Carlos Rivera's Problems & Puzzles - Puzzle 7 website. adding the surrounding primes creates another palindrome ! our palindrome can be expressed as the sum of three consecutive primes ! that have a palindromic term in the sum somewhere. Giovanni Resta (email) found eight more solutions to this assignment. Well done! of "small" solutions (with 19-39 digits) in a day. For all the details of his clever approach I refer to Carlos Rivera's webpage at http://www.primepuzzles.net/puzzles/puzz_007.htm. I prefer above the others because of its palindromic length ! Let w be "0" followed by 69 concatenations of "70". These 4 primes were proved with Marcel Martin's Primo. Jens's current record is a solution with 527 digits. Amazing! that is the sum of three or more consecutive primes ? Click here to see his solutions. They were all sent to me by email starting from [ August 26 & September 28, 1998 ]. Note that some palindromic primes have very interesting patterns ! 11155555111 - a generalized plateau prime - is expressible as 3 and 7 consecutive primes (see table (!)). See also Carlos Rivera's Puzzle nr. 23 : Pal-primes adding consecutive primes. Jens Kruse Andersen (email) found three titanic solutions (1001 digits). For the strategy of his clever approach I refer to Carlos Rivera's webpage at http://www.primepuzzles.net/puzzles/puzz_023.htm. this problem can find bigger solutions. The palprimes were proved with PrimeForm/GW and all the other primes with Marcel Martin's Primo. Impressive, to say the least, Jens ! Click here to go to a dedicated page. The palindromic primes are already categorised. %N The number of prime palindromes with n digits. under A016115. Can you grasp and differentiate the following sequences ? %N Palindromic reflectable primes. under A007616. %N Reflectable emirps. under A007628. %N Primes whose reversal is prime. under A007500. %N Emirps (primes whose reversal is a different prime). under A006567. Click here to view some of the author's [P. De Geest] entries to the table. Click here to view some entries to the table about palindromes. The site The largest known primes keeps monthly updates also about palindromic primes. Note that the length of this giant is palindromic too (no coincidence!). The largest one in the list [ dating from April 28, 1999 ] is 10^30802 + 1110111*10^15398 + 1 and is 30803 digits long ! Harvey Dubner published various articles about palindromic primes in the Journal of Recreational Mathematics. Most of Harvey's record palindromic primes are on display. In Keith Devlin book All the Math that's Fit to Print chapter 92 we read about the largest known palindromic prime number (back in 1987 !). It starts and ends with a 1, has a single 5 in the middle, and zeros everywhere else for a total of 2.977 digits. Primes can even be palindromic (reading the same backward as forward) and be in arithmetic progression. (70607, 73637, 76667, 79697), (94049, 94349, 94649, 94949). The respective common differences are 810; 3030; 3030 and 300.
which was proved by Harry L. Nelson in 1980.
other known repunit primes are 11, and the primes formed by 19 and 23 units. but this has not yet been proved." I'd like to state here that since then R1031 is found to be 100% prime. (Sloane's A004023; Madachy 1979, Williams and Dubner 1986, Ball and Coxeter 1987, Granlund). T. Granlund completed a search up to 45,000 in 1998 using two months of CPU time on a parallel computer." A033938 Palindromic primes n such that the period of 1/n is a palindrome. - Jud McCranie, G. L. Honaker, Jr.
A037010 Differences between adjacent palindromic primes. - G. L. Honaker, Jr.
A039944 Undulating palindromic primes of form [ AB ]nA with alternating prime and non-prime digits. - G. L. Honaker, Jr.
A039954 Palindromic primes formed from the reflected decimal expansion of pi. - G. L. Honaker, Jr.
A046852 Numerator of sum of reciprocals of first n palindromic primes. - G. L. Honaker, Jr.
A046853 Denominator of sum of reciprocals of first n palindromic primes. 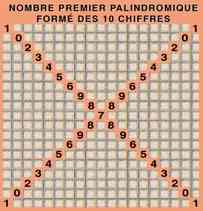 - G. L. Honaker, Jr.
A046941 Primes p(n) which are palindromes and their indices n are also palindromes. - Carlos B. Rivera F.
A047076 a(n+1) is the smallest palindromic prime containing exactly 2 more digits on each end than the previous term, with a(n) as a central substring. - G. L. Honaker, Jr.
A048796 Palindromic primes formed from decimal expansion of pi written backwards then forwards. - G. L. Honaker, Jr.
A052205 a(n+1) is smallest palindromic prime containing exactly 3 more digits on each end than the previous term, with a(n) as a central substring. - G. L. Honaker, Jr.
A053600 a(n+1) is the smallest palindromic prime with a(n) as a central substring. - G. L. Honaker, Jr.
A054797 Smallest prime number whose digits sum to nth palindromic prime. - G. L. Honaker, Jr.
( © All rights reserved ) - Last modified : September 24, 2015.